The most impressive Indian yacht, however, is Vijay Mallya's Indian Empress, bought in 2006, for an estimated �?�72 million. Anil Ambani bought one for his wife, Tina, six years ago. Vijay Mallya has one, so do Adi Godrej, Gautam Singhania and real estate baron Sunny Wadhawan. India has yet to see a booming yacht business - and the number of luxury yacht owners is barely 50 - but a beginning has been made. Riva 122 Mythos: It is the largest aluminium yacht ever made by Riva. The one Ambani bought, for instance, is a 34-metre-long beauty called TIAN - the name is a combination of the first two letters of his wife's and his own first names. Though the yacht's price could not be independently verified, it is believed to have cost around 12 million euros (Rs 96 crore). Add to it delivery charges and an import duty of 28 per cent - it had some hiccups getting past Customs - and the price rises even higher. (Import duty has since risen to 48 per cent.) The interiors - the furniture, the colour, the bed linen and curtains - are custom made, all said to have been selected by Tina herself. Godrej's yacht is reported to have cost him 1.9 million euros, while Wadhawan's came for a cool 5 million euros. The most impressive Indian yacht, however, is Vijay Mallya's Indian Empress, bought in 2006, for an estimated 72 million euro. At 92 metres length, it is a grand spectacle and was originally owned by the royal family of Qatar. Paintings from Mallya's personal collection adorn the walls of this mini-ship that has two master staterooms, three suites and 11 twin rooms, apart from a helipad, a gym, a salon, a massage room, a jacuzzi, an elevator and a baby grand piano which once belonged to Elton John. Yet, even Indian Empress can't compare with the opulence of the costliest of global yachts. Take Dilbar, owned by Russian billionaire Alisher Usmanov, which cost 207 million euros - apart from stunning interiors, it includes a helipad and a swimming pool. The Dubai, owned by the monarch of that Gulf state, Sheikh Mohammed bin Rashid Al Maktoum, is 157-metre long with seven decks and space to even lodge a small submarine. But the biggest of them all in the one owned by the President of the United Arab Emirates, Sheikh Khalifa bin Zayed al-Nahyan, Azzam 177 metre long and costing 677 million euros, which took four years to make and is said to have 50 suites. 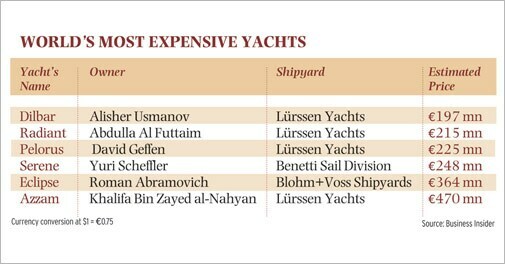 Both Dilbar and Azzam were manufactured by renowned luxury yacht maker Lurssen Yachts. 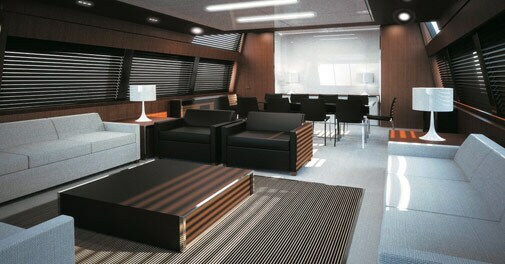 Riva 122 Mythos cabin suite: The furniture, linen, wood colour can be customised. The salon can easily accommodate more than 20 people. 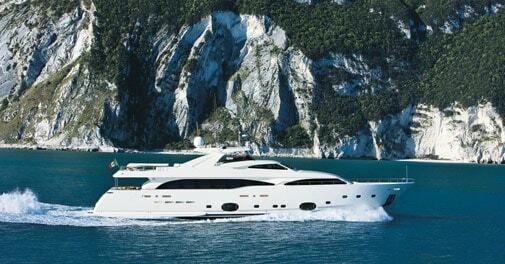 Most Indian-owned luxury yachts, however, come from Italy's Ferretti Group, world leader in the field. Started in 1968, it has grown bigger and bigger, alongside a host of acquisitions such as CRN in 1999 and Riva in 2000. Other global heavyweights include Benetti, OTAM and Logica Yachts. In India, the dealer for most of these yacht-making companies is Marine Solutions, run by the husband-wife duo, Gautama and Anju Dutta, the former himself a winner of numerous yachting competitions. Manufacturing a yacht, they explain, takes much more time than other vehicles which come off an assembly line. "Though the hull and most of the outer design remains the same for a particular model of a particular size, the interior may be completely different depending on the taste of the buyer," says Anju Dutta, Managing Director, Marine Solutions. "The process starts at the drawing board and then the customer is taken to the shipyard. We try to understand what sort of yacht you are looking for - what size, how many cabins, where you want to sail and of course what your budget is. The architect and designer sit with you. And then there is computer modeling to show you exactly what it will look like." The time taken can vary from six months to three or four years, depending upon the amount of customization sought. There are, however, limits to customization. Classification societies in different countries lay down specifications for marine vehicles which have to be adhered to. The European Union, for instance, has a recreational craft directive (RCD) for boats between 2.5 and 24 metres. These relate not only to the engine but also the interiors - locations of bedrooms and bathrooms cannot be arbitrarily changed as this might affect weight distribution of the vehicle. "We have to meet RCD norms," says Gautama Dutta, Director, Marine Solutions. Still, cabins can be merged to make them bigger or a salon or bar added, if the customers asks. Indian customers, company sources added, were primarily interested in the appearance of the yacht rather than technicalities. 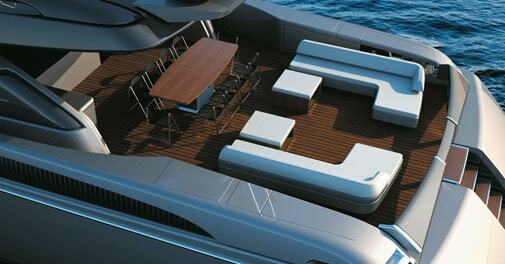 Among the Ferretti offerings, it is the Riva label that signifies ultra-luxury. There are no Riva yachts in India yet but Gautama Dutta indicated there would be one soon, though he refrained from naming the owner. Riva's latest addition is the Mythos 122 - 37 metre long, using 35 tonne of aluminium - which took 50 people working for 18 months to complete. Large parts of the boat are also made of wood, hand polished with multiple layers of lacer coating. "It is as if a new child or a new travel companion has joined our Riva family," said Alberto Galassi, Group CEO at Ferretti in an emailed reply to Business Today. "Celebrating this new heir to Riva's history - the brand's flagship as well as its most futuristic product - is simply extraordinary." Ferretti's rivals too have new offerings. Benetti has its 55-metre Ocean Paradise which also includes a concealed garage. OTAM is launching Crazy Too, with interiors designed by Christiano Gatto. Logica Yachts's new Logica 147 has a swimming pool on the main deck, and interiors created by London's Martin Kemp Design. 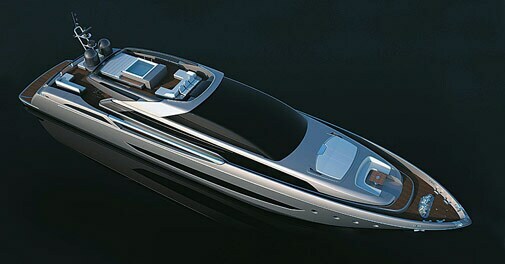 The day these ultra-luxury yachts come to India - where a yachting culture is only just taking shape - is eagerly awaited.